EAA is not just for DSO's. Here are a few shots from yesterday using a Lunt 50HTa solar scope and an ASI 178 MM camera. Solar imaging is like planetary imaging. There are no background stars so you can't live stack. All of the beautiful solar images you may have seen are the result of alot of post-processing (stacking, sharpening, etc) but you can still see some cool stuff live with EAA. One image is of some surface detail and the other is of a few small prominences (small but actually as big as the earth!). The exposure required to capture each is markedly different so they are usually captured separately and them combined later in post-processing. 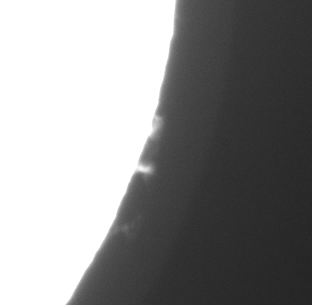 The exposures used were 0.86 ms for the surface shot and 31 ms for the prominences. Gain 79. Single frame live screen capture in Sharp Cap. I hope you enjoy. The sun is really interesting in that is its very dynamic. Even in a slow solar period, there is always something to see in the H-alpha band. And it changes daily or even more frequently. Well yes, but the CN EAA community is mostly DSO slanted. I find my EAA Solar activities more a fit in the Solar Observing and Imaging section of CN. Cropped, animated from 4K video 30fps recorded out of Sony a7s, Lunt 100LS Solarscope. but I have decent success capturing disk edge proms along with surface detail simultaneously. My first guess is that the object is a satellite, but I did the math. Even if it were as low as 200km from the observer, the speed of the object would be just north of 12km/s, which is considerably higher than the ~7.8km/s speed for a circular orbit at that height. My best guess is that it is a 3' weather balloon which would put it at about 11 miles from the observer and moving at about 22mph. If it were an 8' weather balloon, it would be about 29 miles out and moving at 60mph. I have another silhouette capture of a larger round balloon (another day) that misses the Sun but is illuminated by the fringe h-a disk glow.... Depending on one's terrestrial situation, one is bound to capture particular things transiting! By the way... you can use mono cameras in Firecapture and with the display settings give your live image a nice golden yellow color. 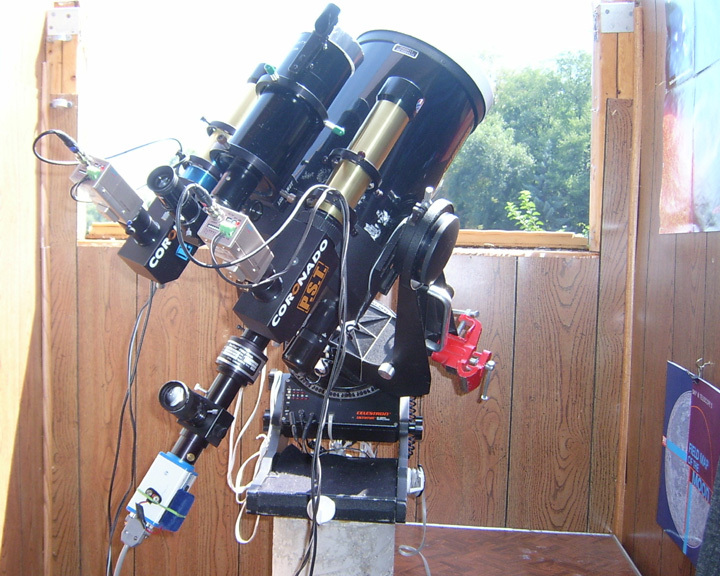 I use to be more into doing solar videoastronomy with my old Stellacam-EX and other analog cameras, using white-light, PST Ha & CAK, and a Daystar .6A T-Scanner. Here's my solar website, http://www.stellar-j...olar/Bwwso4.htm , though i haven't added anything new in the past couple of years. 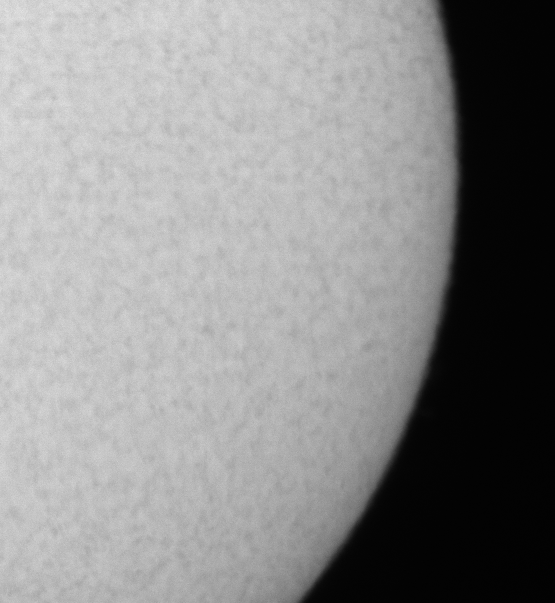 Piggybacked 80mm RFT with a Baader Solar Film filter (white-light) for visual. 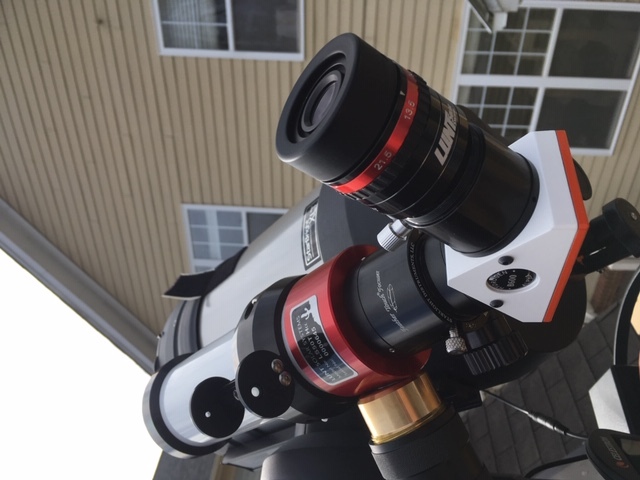 Though recently, I've been thinking about getting back into solar video-observing. Probably after I finish-up my current Herschel-2500 video-capture project. Wow! That is quite a setup!